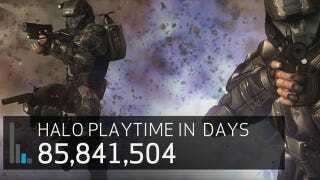 As Halo creators Bungie say their last goodbyes to the series they created back in the 1990s, the developer has released a record of some multiplayer statistics gathered over the years. They are mind-blowing. Seriously, even if you hate Halo, it's still an interesting read seeing the sheer scale of the numbers. While lots of developers pull this stunt to try and draw attention to their games, it usually comes across as a little desperate, because past the TEN YEARS OF HUMAN DEATH or MORE GAMES THAN DAYS IN A YEAR claims you can still see nobody really plays the thing. Halo, though, has nearly ten years of cumulative multiplayer experience, and in that time some of the numbers its racked up over Xbox Live are genuinely impressive. Like the fact that if you laid out uploaded screenshots it would circle the moon twice. Or that if you added up the combined playtime Bungie's servers have tracked it adds up to over 235,000 years.